Home | Resources | News & Blog | Disciple Making…It Helps to Know Where You’re Going! Disciple Making…It Helps to Know Where You’re Going! I love Google Maps. You simply take your phone, type in where you want to go, and the app guides you step by step in how to get there! The only requirement for it to work…is that you must know where you are going. At Friendship Baptist Church over the last year, we have prayerfully sought to both encourage and equip our members to be involved in the Great Commission as they let God use them by making their life available to touch another life. Disciple making should be organic and flexible…but it should also be directional. In order to provide direction to our church, we have published a disciple-making map. Within this map, we are providing a framework that we pray will lead many people to progress over time from disciplee to discipler. 1. Salvation – These resources are available as we reach out to people who are not believers, or who are working through issues related to salvation. – Simple Christianity – This is a booklet that contains lesson one from Foundations on salvation. It is an excellent Bible study on the subject of salvation that will be valuable in helping a person walk through what God’s Word says about this topic. – Done by Cary Schmidt – This short book is a wonderful explanation of the Gospel. If a person you know just needs to shore up their understanding of the Gospel and where they stand in relation to it, you will find this book to be very helpful. – Stop Asking Jesus into Your Heart by JD Greear – This is also a short book that looks squarely at the scenario of a person who has made a profession of faith…but is struggling with whether or not they are genuinely saved. 2. Foundations and Church Membership – These resources are designed to be used by people in a weekly meeting. – Foundations – This is a Bible study through the basics of Christian teaching. It takes someone through topics such as salvation, assurance of salvation, baptism, God’s Word and prayer, the local church and my part in it, sanctification, and others. – The Walk – This is a Bible study through topics related to the Christian life. Some of the subjects are the mind, biblical change, Christian home, suffering, spiritual gifts, purity, worship, and a few more. 3. Growing and Sharing – These resources are designed to be used by believers in a monthly meeting. sharing your faith with those around you. – Discipling – This is a wonderful and brief work on the topic. 4. Lifelong Learning – These resources are designed to be used by believers who meet regularly. 5. 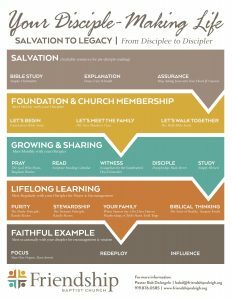 Faithful Example – These resources are designed to be used by disciplers who meet occasionally. As the leaders of Friendship Baptist Church, it is our prayer to equip the saints to do the work of the ministry (Ephesians 4:11-13). We hope that this publication will be a help and that it will bring clarity to where we are going as God continue to direct us!